My day job is running Comic Book World (two locations in KY). As I was checking in our comics shipment before it goes on sale on Wednesday, I took a peak at Future Quest #1. 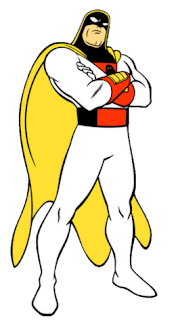 For those that don't know Future Quest #1 is DC Comics attempt to unite all of the Hana-Barbar Superheroes, like Johnny Quest, Space Ghost, Birdman, Herculoids, and more. At the ripe age of 43, I'm pretty happy for some fun and intelligent stories that remind me of my days as a kid and this first issue looks like it will be a winner. So here's Space Ghost for Savage Worlds.